Hi, I'm Pam and I am a Quiltaholic. That is a good thing!!! I love to quilt and want to help others finish their beautiful quilts. Rainbow in the Round made and quilted by Pam Biswas - Coastal Prairie Quilt Showcase 2016, winner of First Place in Modern Quilts, Best use of Color in the Show and Viewers' Choice Award. .Comma Comet by Janet Gannon and Pam Biswas exhibited at quilt shows and a museum across America 2014-2016. Unity with Diversity by Pam Biswas took 2nd place in the Coastal Prairie Quilt Showcase 2016 in the Modern Quilt category. I really enjoy helping others finish their quilts so that all their effort can be enjoyed by them or a lucky person who might be the recipient of that special quilt. I have been sewing since I was six, making quilt tops for over 30 years and quilting for eight years. I first started quilting on my domestic Janome sewing machine and soon after, I decided to start longarm quilting for others. I use an Innova 26" longarm quilting machine and have a 12-foot table making it possible to quilt a king size quilt top up to 120" wide, maybe even a bit larger. I like to discuss the quilting with the quilt top maker and then together we design the quilting. I enjoy doing custom quilting which means that every area of your quilt is quilted exactly as you request or as we decide together. I can also do a single or variety of motifs throughout your quilt which is referred to as edge to edge, or E2E. I can do pantographs which are pre-designed all over quilting that repeats throughout the quilt from edge to edge and top to bottom. Take a look at some of the photos in the Gallery to see some of the quilts I have made and ones I have quilted. If you would like me to help you finish your quilt quickly, see Services details. Be sure to check the Tips page for details on how to prepare your quilt for the longarm quilter. If you are looking for some beautiful fabric, check out the Shop where you will find Michael Miller, Free Spirit, Shannon Fabrics and others. I look forward to working with you to finish that special quilt you have been working so hard to create. Just one of the beautiful Cuddle fabrics in the store. Shop here. Combine this Cuddle Bubble Dot with the Aqua Double Gauze for awesome lovies or tag blankies. Click Here to Shop for these and other new fabrics. One of the focus fabrics from Bake Shop by Patty Sloniger for Michael Miller. Click Shop on the menu to see all the new fabrics in this line. Main Street by Patty Sloniger for Michael Miller Fabrics is a low volume print to coordinate perfectly with Bake Shop. FREE PATTERN BY PATTY SLONIGER WITH PURCHASE OF BAKE SHOP, MAIN STREET. Do you want to learn to quilt? I take many classes from Craftsy and many of them are FREE. You can get started learning to quilt, sew, knit as well as several other fun skills like baking, painting and gardening. Join Craftsy for FREE and see what you can learn online. I'm a Craftsy affiliate and get compensated each time you purchase from the link above. Course Sale at Craftsy: Save ! I learn so much from my Craftsy Classes. Try them, and see for yourself. Are you interested in Quilt Guilds? If so, check out The Modern Quilt Guild. 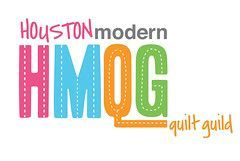 I'm a member of both The Modern Quilt Guild and Houston Modern Quilt Guild. I'm also a member of Coastal Prairie Quilt Guild.